So, today I took an Assemblage Class with Lauretta Lowell, and I created a MASTERPIECE!!!! I’m not kidding, I think this is the BEST piece of art I have ever created. What an awesome day. 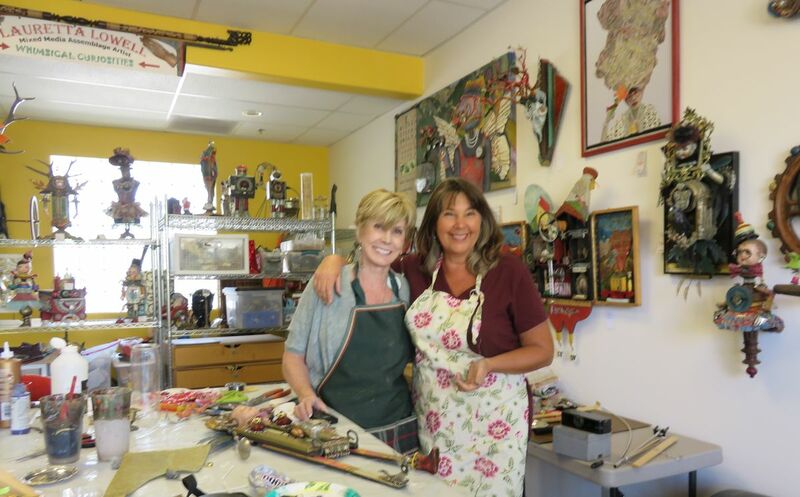 Lauretta has a working studio down in La Quinta, California, and it’s like walking into a Toy Store for Crazy Artists. Name a thing, and she’s got it. 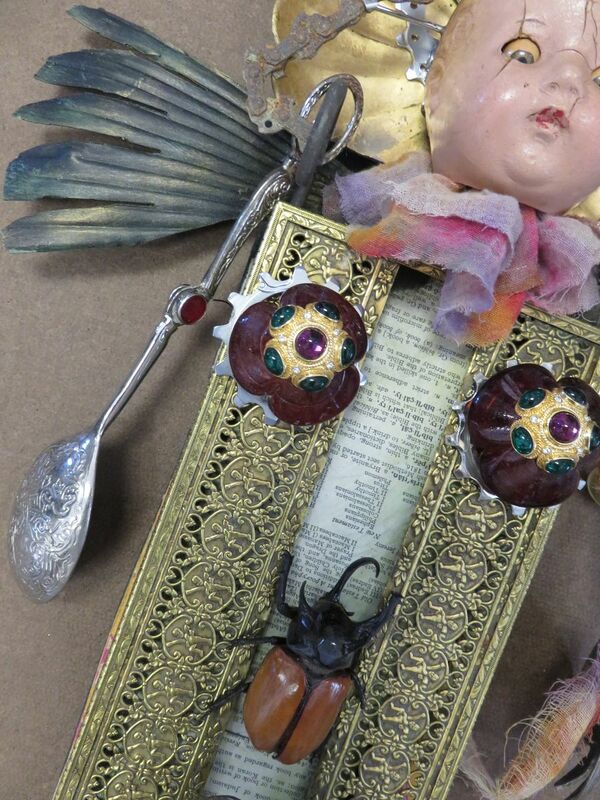 Here are but a few of the astounding treasures available for your arting pleasure. Bike sprockets, real preserved giant bugs, typewriters, doll faces and body parts, old jewellery, alphabet letters, candle sticks, bird cages, circus paraphernalia, post box fronts, metal dishes and boxes, paper, fabric, plumbing bits and bobs, glass doodads, man, I can’t even BEGIN to describe what’s in her studio. I got there at about 9:50 and she was there, ready and waiting, with a wooden base cut out for me to begin my piece on. I painted the edges black and then glued different papers all over it. Lauretta had suggested that I cut the papers to size before applying them, but I was SURE that my way was better – my way being to slop on Matte Medium and lay down badly cut, ill-fitting pieces of gorgeous paper, wait for it to dry, and then sand the edges so that the overhang got cleaned up. The glitch in this plan was the “Wait For It To Dry” part, sigh……. I know this will shock you, but I did NOT wait for it to dry. Naturally, when I started sanding it, I made a mess. C’est la vie, but at that point I actually started listening to her. She’s been doing this type of art for 10? or 15? years, I think, and guess what – she really knows what she’s doing! I had torn out a dictionary page with the word “bicycle” on it, and ironically, the other side of the page was biblical, and listed the names of the New Testament. This was perfect for gluing down, as this piece was a Totem to the Gods of Flat Tires, since I’d had a flat tire on my bike about 4 days previous. Next up was to choose some of the pieces that I’d brought with me to kind of set a theme for the piece, and then – oh happiest of happy!! – she started pulling out all these weird and wonderful things that she thought might also work with my piece. All I can say is OH….MY….GOD!!!! SUCH great stuff. Of the stuff I brought, I used a couple of silver plate tongs (for Arms), some Silver Things (yeah, that’s the technical Term) for a crown, part of a candle holder, two red button snaps off a $3 Square Dancing Shirt that I’d bought to wear in the class to keep my clothes clean, and a rusted bike chain that my sister found about a month ago, while walking in Palm Desert. Everything else was from Lauretta’s Stash-To-End-All-Stashes………… I think at some point I might have actually drooled with pleasure as I was pawing through all the goodies…. The whole process took 4 hours, with the two of us working collaboratively. Mostly that meant Lauretta doing the yucky stuff, like drilling holes, or wiring things. But her eye for design and color, and extremely wacky brain, ensured that all her suggestions were bang-on. And to anyone that’s in the La Quinta area – if you get a chance to go to her studio, or better yet, take a class with Lauretta – JUMP AT IT!!!!! You will not regret it…..
Oh yeah, the “Silver Things” are actually Tire Inflation Needles! This entry was posted in Abstract, Assemblage, Figurative, MultiMedia, Sculpture, Surface Decoration. Bookmark the permalink. 11 Responses to Best Art Day EVER!!!! Glad you had fun, I will have to see it before I make any judgment!!!!!!!!!!!!!! Yeah, this kind of art is not for everyone, that’s for sure! This kind of art is right up your alley – I can imagine you drooling over all of the different pieces available for use. 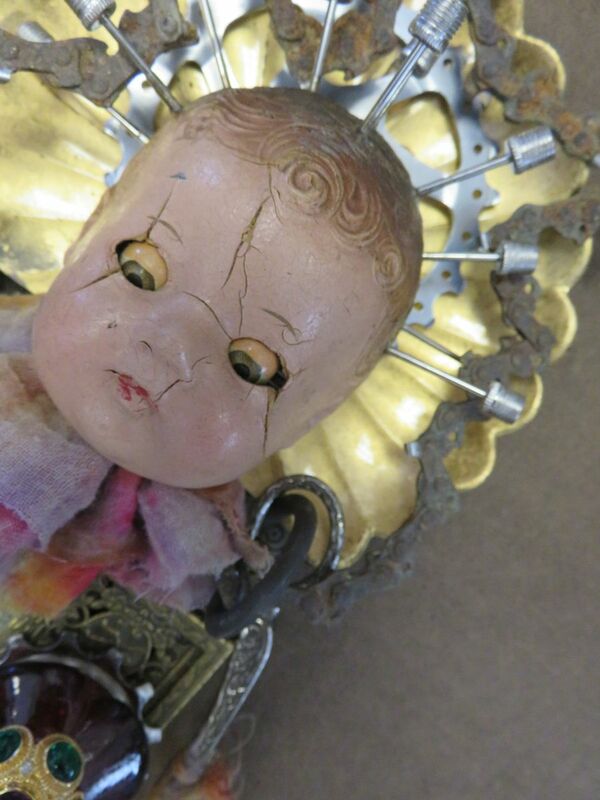 OMG a kindrid spirit who likes creepy doll heads. Who would have thought 🙂 I’m glad you had a fantastic time and have found your artistic soul mate. I knew you would love this style from Lauretta’s website. It sounds like it was a one on one course, so I can just imagine how much you loved it. I don’t have even one onehundredth of the creative brain you guys share for your weird and wonderful art. Can’t say I love it, but I love that you love it. Yeah, one-one-one, which is the BEST way to take a course, in my mind. Very cool. ..an amazing experience. Unfortunately I can’t see the challenging base but love your creation…and your enthusiasm. 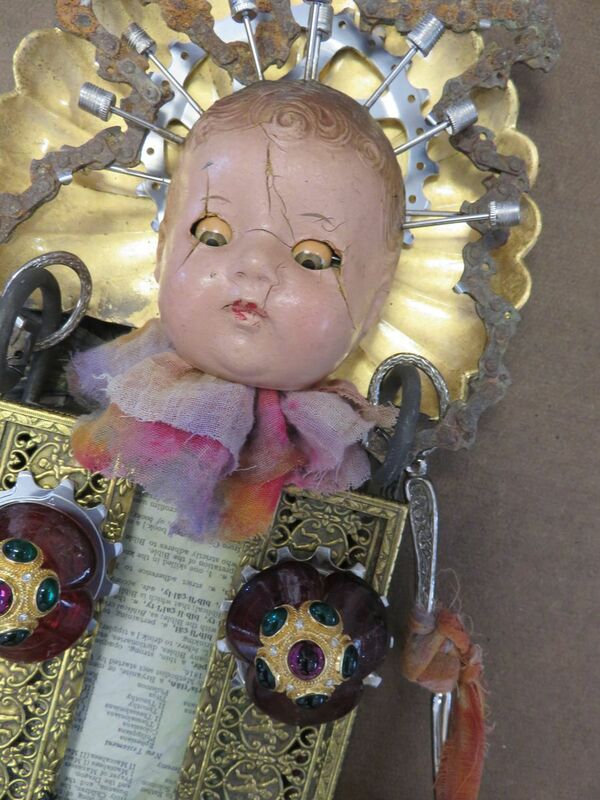 I posted a few more images on the PAGE called Assemblage. You can see a bit of the paper there. This piece is sooooo cool. I would hang it in my house….unfortunately Cher is not will to give it up.